Rolex has long been known for their adventurous watch designs, geared towards a myriad of sportsmen and thrill-seekers. During the 1960’s, Rolex underwent an ad campaign that embodied this sense of adventure, perfectly promoting the right gadget for the job. Rolex’s GMT-Master is a great example of this marketing strategy. 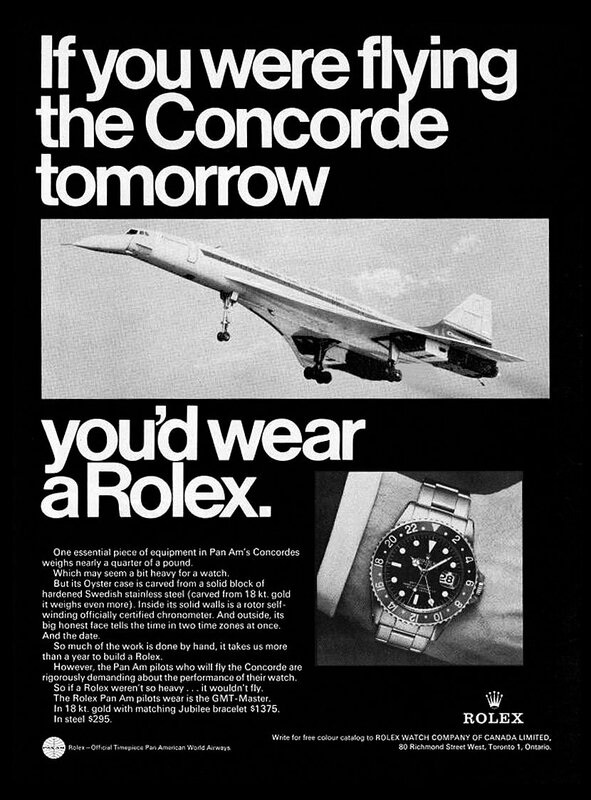 Created with pilots in mind, the GMT-Master ad informs the reader that if they were to fly a Concorde tomorrow, an essential piece of equipment would be their Rolex watches. Just as a Pan Am requires meticulous attention to detail and reliability, so does the pilot require it of his gadgets. That is why he wears a Rolex GMT-Master. Certainly not every Rolex wearer plans on flying a plane. However, many do take time to swim in the ocean. One of Rolex’s most popular and iconic watches, the Rolex Submariner, was specially designed with deep sea divers in mind. Their ad from the 1960’s campaign shows two scuba divers with an underwater submersible, detailing how you would want to wear a Rolex Submariner should you do the same thing. 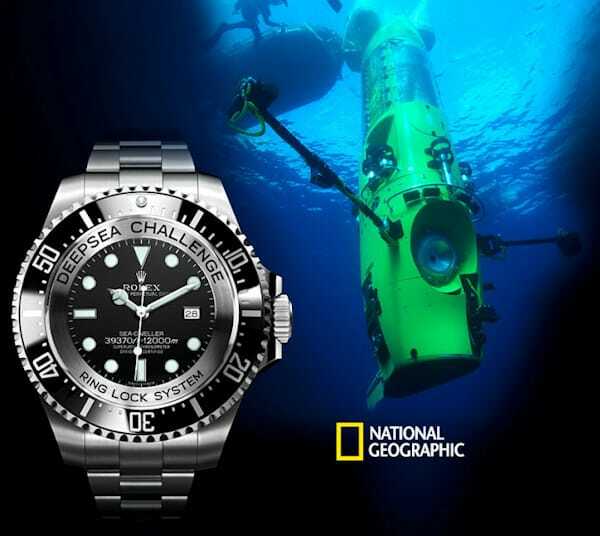 This was best demonstrated in 2012 when a Rolex Submariner went on James Cameron’s Deepsea Challenger dive to 25,756 feet (or 10,989 meters) under water. No watch has ever been to such depths, much less returned completely unharmed and in perfect working order. 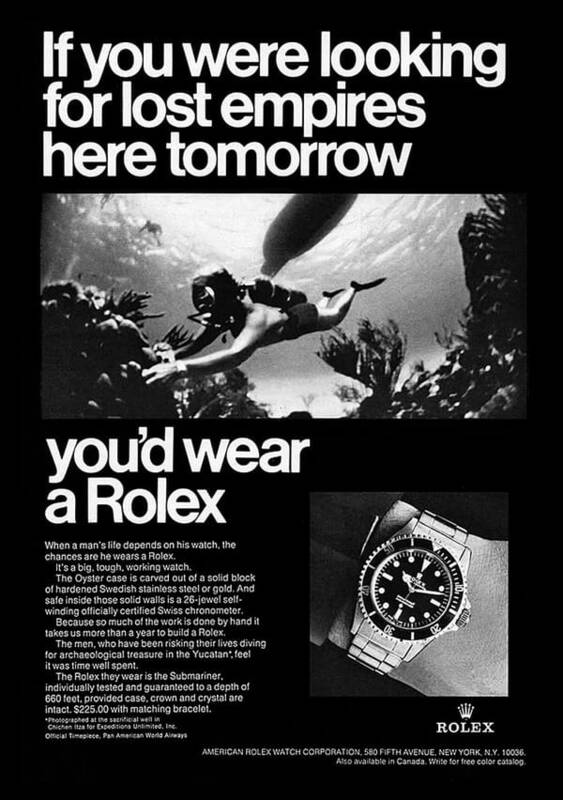 A similar ad for the Submariner shows a snorkeler “looking for lost empires” underwater. Rolex has always emitted a sense of wonder and adventure. It is no surprise that they use this to appeal to the adventurer inside their customers. Whether you plan on deep sea diving, exploring lost underwater cities, or simply want a reliable and waterproof watch that has literally been to the bottom of the ocean and back, the Rolex Submariner is for you. One cannot discuss a sense of adventure without thinking about the association of Rolex with racing. 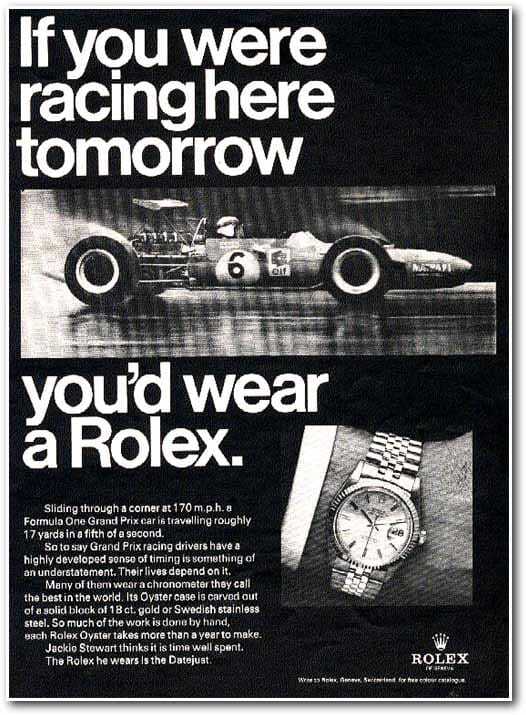 The Formula One Grand Prix was used in a Rolex ad to inform their customers that, should they wish to wear a timepiece that offers a highly developed sense of dependable timing, such as a racecar driver would need, the Rolex Daytona is for them. 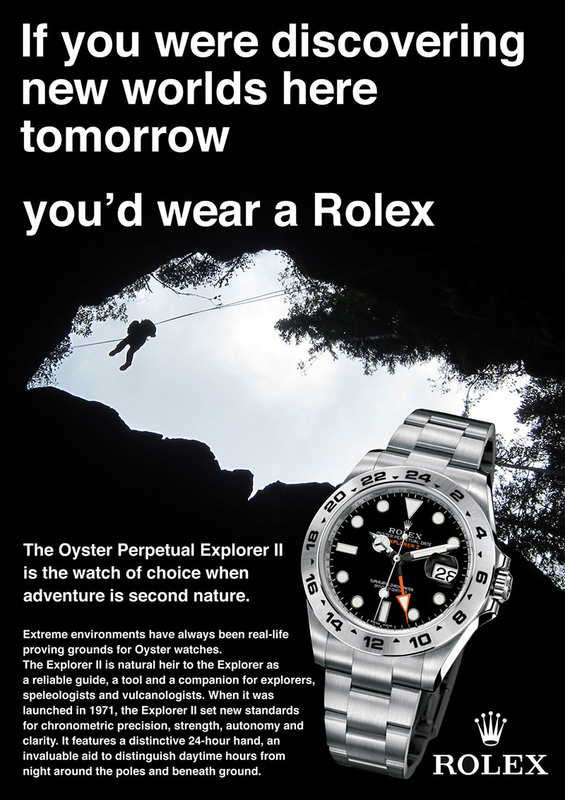 Finally, no watch embodies Rolex’s sense of adventure quite like the Oyster Perpetual Explorer II. With an ad highlighting a figure cave diving, one immediately understands that this watch, with its distinctive and specially designed features, is tough, reliable and a valuable tool when exploring the world. By highlighting the most extreme users for their watches, Rolex has created a sense of reliability and versatility for their impressive watch line.